(CNN) -- The fiberglass head weighed 600 pounds and resembled Clarabell the Clown from the 1950s "Howdy Doody Show." Bill Ziegler, owner of the Wild Bill's nostalgia store, stumbled across it on an artist's Web site and wondered if it would work for a project he had in mind. Salem Sue stands watch in New Salem, North Dakota. She measures 38 feet tall and 50 feet long. Ziegler recruited the artist to help him attach the giant head to his 33-foot farm silo. By October 2008, the pair had built the world's largest jack-in-the-box. The jack-in-the-box extends 50 feet in the air, moving up and down approximately once a minute. "They love it," Ziegler said of the tourists who come to his store. He's had visitors from as far away as England -- one couple who saw the story of the jack-in-the-box in a British newspaper decided to stop by. All across the country, roadside attractions like this one bring surprise and delight to travelers who just have to get a closer look. "In many parts of the country, you can plan an entire road trip where you visit nothing but 'world's largest' attractions," said Doug Kirby, the publisher of RoadsideAmerica.com. Kirby's Web site pays homage to odd attractions -- from Ziegler's jack-in-the-box in Middletown, Connecticut, to the world's largest ketchup bottle in Collinsville, Illinois, to the world's largest sundial in Carefree, Arizona. Visitors do more than snap a picture at the world's largest ball of twine in Cawker City, Kansas. Linda Clover, self-described keeper of the ball, gives tourists twine to add it to the attraction. "People like to be a part of it," Clover said. "It shows that with lots of patience and a lot of people helping out, you can end up with something very big." Clover ended up in charge of the ball in a roundabout way. Farmer Frank Stoeber started the ball of twine in 1953. When he died, his cousin took over. And when his cousin died, Clover stepped up. "I know that people like to come and see it. And someone had to take care of it," she said. "My husband used to say that people asked me to do something and I couldn't say no." Clover keeps twine with her in case an interested tourist gives her a call. The ball measures more than 40 feet across. It contains 7.9 million feet of twine and weighs approximately 19,000 pounds. And every year in August, Cawker City hosts a twine-a-thon event to hold on to the world's largest ball of twine record. 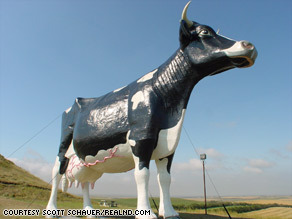 Salem Sue, dubbed the world's largest cow, is in New Salem, North Dakota. She measures 38 feet tall, 50 feet long and is made up of 12,000 pounds of fiberglass. Scott Schauer, producer of The Real North Dakota project, features Salem Sue on his Web site, which is dedicated to showing tourists the best of North Dakota. As a kid, Schauer used to drive by the cow with his family. He thinks many people pass similar road trip traditions on to their kids, hence their appeal. "I remember being mesmerized by their monstrous size. No matter how many times I saw them, I always looked forward to seeing them again and again," Schauer said. "As an adult, I still look forward to seeing them. I guess some things don't change with time." The world's largest horseshoe crab resides in a parking lot at the Freedom Worship Baptist Church in Blanchester, Ohio. Last year, the church's pastor, Jim Rankin, hired Evel Knievel's former bodyguard to jump over the crab on his motorcycle. The publicity stunt attracted nearly 8,000 visitors to the church. The crab is 68 feet long from its head to its long, spiky tail. "It can have up to 65 people inside," Rankin said. In the 1970s, Ashburn, Georgia, built a monument to the state's No. 1 cash crop. Standing atop a brick tower along Interstate 75, the world's largest peanut can be seen for miles. The peanut is 33 feet tall with a 10-foot circumference. The peanut was featured on a Go-Gurt portable yogurt packet as a trivia question, said Shelley Zorn, Ashburn's chamber of commerce president. It also showed up on a Food Network show. "Hilarious, isn't it?" Zorn said of the public's love affair with the peanut. "I can meet people on a cruise ... and I ask them if they've seen it. Nine out of 10 people have seen that peanut, no matter where they're from." Recognition is the main reason people build the world's largest attractions, Kirby said. His site rates places higher if they surprise his staff or make them laugh. iReport.com: See the "world's largest rocking chair"
"Towns build giant statues to promote themselves and take pride in local heroes, historic figures or industries," Kirby said. "Businesses commission creation of giants so they stand out from their competition. For individuals, a 'world's largest' something may be a hobby gone out of control. ... Creators fret about their legacy. This 'world's largest' may be how the world remembers them." That is, until someone builds a bigger one.